A stunning hat-trick from Jack Devlin kept North Shields on course for a top-five finish as they beat Washington 4-2 on Wednesday evening. The 18-year-old spurned a number of chances in the previous game at Jarrow Roofing, where Shields snatched a late point in a 1-1 draw, but he was in unstoppable form at the Nissan Sports Ground. His three goals, and a fourth from Dean Holmes, were enough to see off the Mechanics, who twice hit back through Mark Davison. Shields started on the front foot, probing to find that space behind the back four, and a sublime diagonal ball from Ben Richardson did just that on 16 minutes. Devlin, deployed on the left flank, burst beyond full back Steven Stewart and showed remarkable confidence and composure to dink the ball over Jonathan Carmichael and into the Washington net. An unmarked Davison stabbed well wide at the other end, but the Robins continued to supply the killer passes that split the hosts’ defence. Another attempted lob, this time from Ryan McGorrigan, didn’t quite have enough lift to beat Carmichael, while Devlin curled a matter of inches wide on the half hour mark, having cut inside onto his right foot. The teenage forward only had to wait 60 seconds for his next opportunity, and took it with aplomb. Gary Ormston sent the decisive pass over the top of the flat-footed defence, affording Devlin a clear run on goal. He gave Carmichael the eyes before rounding the keeper, stroking into the empty net to double his and Shields’ tally. Washington were quick to strike back, however, and halved the deficit in the 33rd minute. John Butler found Davison towards the corner of the penalty area, and though the angle was narrow, the striker unleashed a shot of the highest accuracy, the magnificent finish soaring into the top corner. Despite the goal, Shields continued to enjoy the more meaningful possession, and only two saves from Carmichael kept Washington close at the break. First, the stopper tipped a superb effort from Holmes around the post, and was there to deny Kevin Hughes from the resulting corner, a thunderous low drive from the centre-half blocked at close quarters. North Shields restored the two-goal advantage eight minutes into the second half. The Robins were picking out the runs of Jack Devlin at will, Ryan Carr the latest to find the forward with another fine pass. 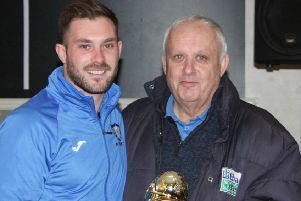 Devlin, a former Queen of the South trainee, once again pulled off his party trick, lobbing the stranded Carmichael to complete the hat-trick – the first of any Shields player to do so in 2015-16. Joseph Walton fired off target for Washington following a good spell of pressure from the hosts, but despite making changes at the back, Stephen Hutchinson’s men still looked vulnerable, and would concede a fourth goal in the 67th minute. Carr was the provider once more, chesting the ball into the path of Holmes. The latter made good on his goal threat, turning towards goal and firing low into the bottom corner via the base of the post. The dangerous Davison refused to down tools, one shot fired over and another charged down by a combination of Chris Bannon and Curtis Coppen, but the Washington striker grabbed his second with the last move of the game, heading substitute Aaron Croft’s delivery into the top corner. It failed to take the shine off a pleasing Shields performance, with a host of players – not least the hat-trick hero – putting in eye-catching turns. Should they win their final game of the season, a home tie against Durham City on Friday evening, the Robins will leapfrog Newton Aycliffe into fifth place, potentially capping off another silverware-winning season with a strong league placing. North Shields: Bannon, Donnison, Brooking (Summerly), Ormston, Parker (Coppen), Hughes, Carr, Richardson, McGorrigan, Devlin (Bainbridge), Holmes.